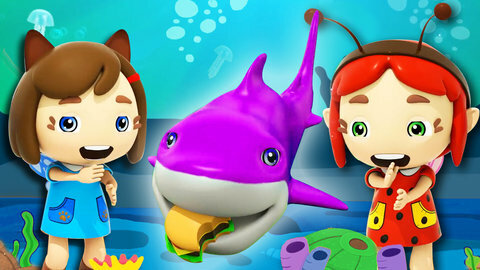 Watch the little fairies dance with the shark family in this music video for girls featuring the kids’ song entitled Baby Shark. At first the fairies are happily dancing with the sharks but then they got hungry and started to chase the fairy with a burger on its hand. Watch till the end to see if the fairy got away and to figure out what happened to the burger. Sing more songs while watching funny cartoons about little fairies for free when you visit SeeZisKids.com.